New book, 80 pages, RAID37. In April 1713 the War of the Spanish Succession came to an end. During the conflict hundreds of privateers - licenced pirates - preyed on enemy shipping throughout the Caribbean. These privateers now found themselves out of a job, and many turned to piracy. 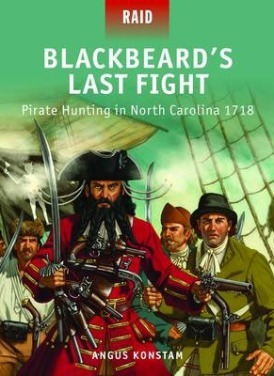 One of them was Edward Teach - more popularly known as Blackbeard. He joined the pirates in New Providence (now Nassau) in the Bahamas, and by early 1717 he had become a pirate captain. From then on he caused havoc off the North American seaboard, in the West Indies and off Honduras, before appearing off Charleston, South Carolina in May 1718. He blockaded this major port for a week, an act that made Blackbeard the most notorious pirate of his day.